CHICAGO, IL – The Center for Alcohol Policy (CAP) Eighth Annual Alcohol Law and Policy Conference kicked off day two at the Hyatt Chicago Magnificent Mile in Chicago, Illinois, with keynote remarks by South Dakota Attorney General and National Association of Attorneys General President Marty Jackley. This annual event brings together a wide range of alcohol policy experts – including attorneys, current and former alcohol regulators, legislators, law enforcement, public health advocates and other experts – to discuss and debate current alcohol laws and challenges. 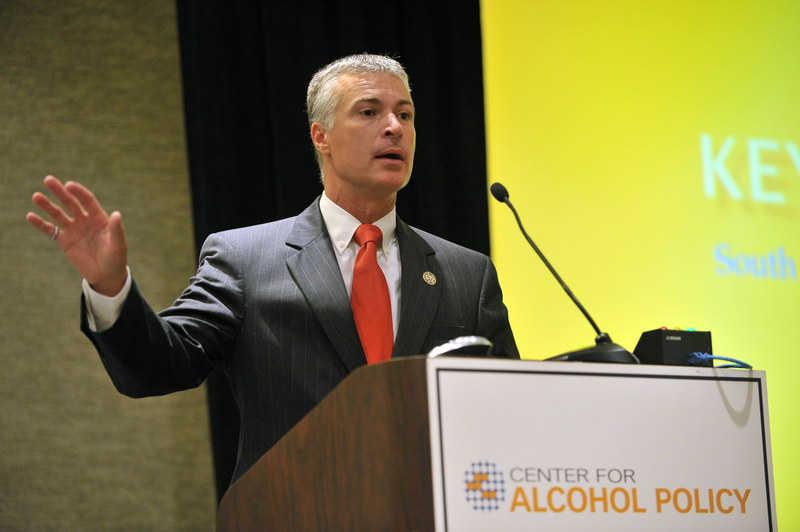 Attorney General Jackley detailed the role of state attorneys general in alcohol policy debates and the importance of policies that safeguard against the abuse of alcohol. Since taking office in 2009, Attorney General Jackley has been committed to fighting crime, strengthening public safety and making South Dakota a safer place to live. Now serving his second term, Attorney General Jackley continues to implement programs aimed at protecting the citizens of South Dakota. To that end, he has worked to expand South Dakota’s 24/7 Alcohol Sobriety and Monitoring Program across the state and nation, which has proven successful in reducing the likelihood for alcohol re-offenses. Center for Alcohol Policy Advisor and Former Chairman of the National Traffic Safety Board James Hall led a discussion on how to measure the efficacy of U.S. alcohol control policies, which included insights from Dr. William Kerr of the Public Health Institute and Toben Nelson, associate professor of epidemiology and community health at the University of Minnesota. The conference concluded with a panel of state legislators discussing alcohol legislation, economic development and public health. Center for Alcohol Policy Executive Director Mike Lashbrook moderated the discussion with Illinois House of Representatives Majority Leader Louis Lang, Pennsylvania State Senator Chuck McIlhinney and Michigan State Senate Regulatory Reform Committee Chairman Tory Rocca, who shared the lessons they’ve learned from debating legislation that appropriately balances economic growth with public health concerns. The legislators discussed efforts to weigh competing state interests related to law enforcement, public health, orderly markets, taxation and jobs. Visit www.centerforalcoholpolicy.org for a summary from day one of the conference and the full conference agenda. Read live updates from the event on Twitter using the hashtag #CAPLaw.